A record number of speakers (59!) headed to the Caribbean for Engage’s fourth visit to Grand Cayman. The branding and gifting inspiration was Island Modern, Re:visited and focused on island tunes and beach chic accessories. Many attendees arrived early or stayed late, enjoying extra beach time along with business. The barefoot Welcome Party on Seven Mile Beach complete with fireworks set the celebratory island tone, as did the color palette, drawn from past events and representing Cayman’s sun, sea, sand, palms and stingrays. On day one, Darcy Miller chatted with baker extraordinaire Ron-Ben Israel, Simon T. Bailey motivated the crowd and David Beahm stressed the importance of kindness with clients and competitors. Things got intimate the next day, when Marcy Blum shared candid learning’s from unexpected business ‘slumpdum’, Ed Libby told his very personal story of struggle & triumph, and Todd Fiscus shared an insightful look at Ten Things he has learned in business in the last 10 years. Throughout the entire event, Carla Ten Eyck pulled attendees aside for a series of stellar portraits that captured their outer and inner beauty. The breakout sessions covered a variety of targeted topics. Planner Amy Zaroff addressed core values; Lynn Easton Andrews talked about going national from a secondary market; Mark Ingram, Julie Sabatino and Oscar de la Renta’s Tara Maietta discussed couture fashion; and the New Media panel gave insight from The Huffington Post and The Venue Report. Other offerings included destination-wedding insights from Destination I Do’s Jennifer Stein and Jet Fete’s Harmony Walton; media consultant Jill Meister’s strategies for wowing on television; and the first-ever panel focused on Indian weddings. Post-sessions, an afternoon of fun included a private charter catamaran sail to Stingray City along with jet skiing and a snorkel tour. The over the top Farewell Gala was designed by Karen Tran and produced by Cayman’s own Celebrations Ltd., incorporating thousands upon thousand of orchids and roses shipped in for the event, inventive food stations from The Ritz-Carlton, and endless bubbly from Veuve Cliquot. 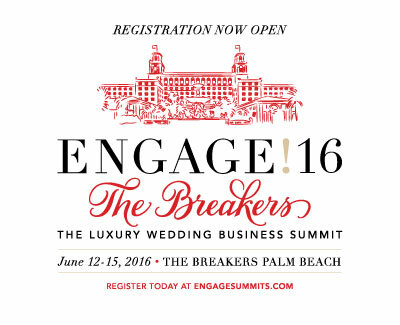 Anyone who is contemplating attending Engage! shouldn't think twice. A+ the whole way through! Engage! was life changing for me in many, many ways. Everything about Engage! is well done. I appreciate (and expect) a well graded experience and you did not disappoint. I crave quality lectures when attend these things - and you surpassed my expectations. Being a part of Engage! was truly an honor and I was so inspired. I continue to be amazed by the collaboration and open attitude of all your guests.